Well welcome back!! We're so excited! It’s our AUGUST RELEASE Day at KRAFTIN' KIMMIE STAMPS!! And we’re celebrating with a KRAFTY HOP!! Over the last few days in our Krafty Peeks, we have shared lots of AMAZING new stamps from all our artists for our Halloween release! We’ve got something for everyone!! We've got TWO WICKED new sets from Nicole.......FROM BEYOND THE GRAVE! and TIME FOR A COFFIN BREAK!! We’ve got TWO sweet new TRICK OR TREATER sets from Cheryl……HEY GHOULFRIEND! and YOU'RE FANG-TASTIC! We have a spoooky but cute new set from Thais Narciso ...... HAPPY HAUNTING! and also artist Rachelle Anne Miller has a trio of awesome new stamps of FABULOUS FALL ! WHEW!! Not only do we have amazing new rubber stamps for all your fall and Halloween creations.....but we've made your creating even EASIER with our *exclusive* new KRAFTY KARDMAKING KITS!!! And we've also got ADD ON packages, in case you want MORE of the goodies found in your kits! 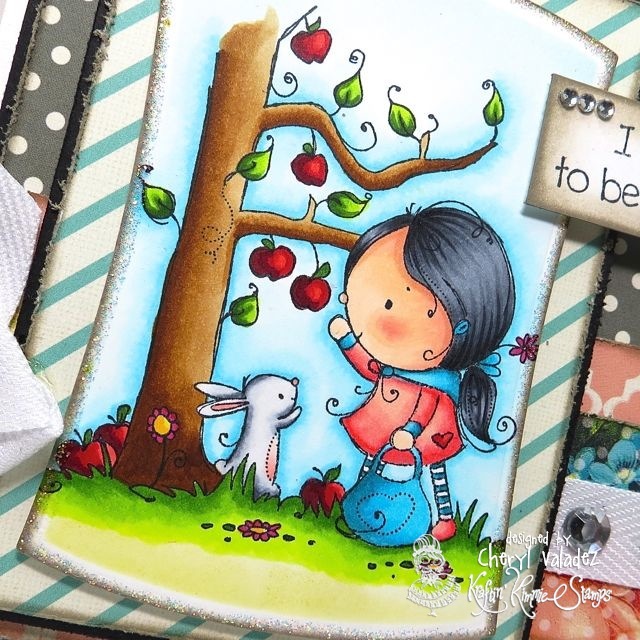 You will get to see ALL of the new images today as you sit back and enjoy our AUGUST Krafty Hop! As you hop from blog to blog, be sure to leave a comment at each and every stop because some lucky stampers will win packages of these incredible stamps from the new release!! And when you’re done hoppin’, be sure to head over to the Kraftin’Kimmie shop, because ALL the new images are available NOW in the KKS Shop!!! Wow! Your coloring is AMAZING! Awesome card! Ooh! This is so sweet. Pick Me, Pick Me - I wish I was your friend and this was coming to my mailbox. Adorable card... Always love your designs! I like your card so! Colors are perfect like everything else! WOW! This is colored BEAUTIFULLY (look at those apples)! I love that blueish glow around the images and that cute bunny! The fall images are definitely my favorite this release! Soooooo beautiful, Cheryl!!! It just makes me smile when I look at it! Gorgeous colors and your coloring is amazing! Love the layout and papers too! What can I say...you're awesome!! Cheryl your card is amazing. What a pleasure its been to visit, I had to scroll back to get caught up on what I missed, what a fabulous bunch of cards, every one of them is drop dead gorgeous, between your layouts and you perfect coloring, you make some of the most beautiful in blog land, thanks for the lovely visit and hope you have a great week. Such a stunning card! Love colors, coloring, just everything in this card!